Trying to make a smart binocular choice despite apparent conflicts in what you find about choosing and buying binoculars? Click here to receive your FREE 7 Easy Tips on how to get the binocular you want. Many people want to know how to buy binoculars, but are hesitant to venture into an unfamiliar topic without understanding binoculars in at least a fundamental way. Here you will find information about buying binoculars that will fit your needs at a reasonable price. For those who are returning to this page, you can skip ahead to the criteria for choosing binoculars. Quite simply, binoculars are two telescopes linked by a hinge and collimated (aligned) so that both eyes will see the same magnified image. They are usually used to see things that we might not be able to see otherwise - generally observing things, people, or activities from a distance. The broad goal in choosing a binocular is to find one that transmits the most useable light to your eyes with the clearest, cleanest, crispest image, while being as lightweight as reasonably possible (for your needs) and easy to use. The best binocular for you depends on what you intend to do with it. This is fundamental in considering how to buy binoculars. The following tips on how to buy binoculars will help with a variety of considerations. Please stay with us as we walk through several examples to illustrate this. If you already understand the impact of intended use, feel free to skip ahead to the Common Approach -vs- the Informed Approach. For example, an 8X25 model might be great for a bird watcher wanting to watch the action at a bird feeder 10-35 feet from the kitchen window in good daylight. That model would be entirely inadequate, though, for the birder wanting to see a predator bird's nest a good half mile distant - who might need a 20X80 tripod-mounted model. If the birder were venturing into a forest with plenty of foliage overhead, an 8X42 or even a 10X56 configuration, depending on terrain, might be better. For astronomy, you may be able to see the moon in general or see star fields with a 7X35 binocular configuration. With a 10X50 including features for good light transmission, though, you will be able to see craters on the Moon, the four bright Galilean satellites of Jupiter, and you will gasp at your three dimensional view of the Milky Way galaxy. You'll want to know what's important and what isn't in astronomy binoculars. Someone wanting to find and watch white tailed deer would do well with a 7X35 or 8X40, but the individual "glassing" for mule deer would more likely want a 10X45 or 10X50 due to the difference in habitats. For hikers and backpackers wanting to keep weight to a minimum, a small monocular (perhaps 7X18 or 8X20) or a compact binocular (8X20 or perhaps 8X25) would certainly fill the need. Depending on the person's desire to see wildlife or distant views, it may be worth the extra weight to shift to a 10X36 or 10X42. Let's say you are attending a baseball game in a large stadium. The binocular you will want if you are beside the field will be less powerful and have a wider field of view than the one you will want if you are in a seat high above the field. Also, you will want to consider if you will be using your binocular more at day games or night games, since you will need larger objective lenses for gathering more light at night games. Someone boating on freshwater lakes may find a smaller 8X36 binocular just as useful as a saltwater boater finds the larger 8X50 or 10X50 configuration - but both will likely want to ensure the binoculars were waterproof! From considering only these situations, you'll see that the configuration and features of your binocular needs are likely to vary depending on your intended use. You've probably already guessed that many people have separate binoculars for two or three different applications. "...you guys have some awesome reviews that are quite thorough and informative!" Many binocular buyers go to the store and simply purchase a low-cost model in appealing packaging, assuming it will satisfy their need. Unfortunately, nowhere is it more true that "you get what you pay for" than with optics. With this no-nonsense guide, you'll learn where you can safely save money on optics and what you don't want to skimp on in order to get the viewing experience that's important to you. We'll identify what the various specifications mean. As an informed consumer, you'll be able to choose what's important to you. With binoculars, it's possible for you to buy ones that you can enjoy for years and the wise keep this in mind when thinking of how to buy binoculars either for themselves or as gifts! We'll discuss each of them in detail so that you'll be able to make informed decisions about how important they are to you. You'll see how higher quality specifications in one area may compensate for less than optimal specifications in other areas. You'll be able to make a wise optics choice to satisfy your needs and provide enjoyable viewing for years. And, while we're thinking about assessing your needs and making sense of what to consider in buying binoculars…. After working with people, we've found there were 7 Easy Tips to keep in mind to get the binoculars they wanted. 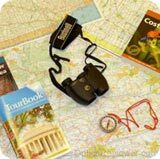 These 7 Easy Tips effortlessly guide a person wanting to make sense of all the information that enters into choosing a binocular. Receiving the tips in helpful e-mails over several days makes it easy to sort it out without information overload. Receive your FREE 7 Easy Tips to get the Binocular You Want by clicking here. The magnification (or power) of a binocular is a reference to the degree to which the image you're viewing is enlarged. For an 8X42 binocular, the first number (8) is the binocular's power. It enlarges the image eight times as large as it would appear to the unaided eye. 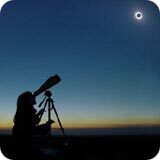 If you view something 80 or 800 feet away, using an 8X binocular will make it appear only 10 or 100 feet away, respectively. It's normal to think that the more powerful a binocular, the better. This isn't necessarily the case. Adding power to a binocular adds weight, for one thing. Binoculars greater than 12X or 15X will be heavy enough that they will be difficult to hold steady and normal hand movements will be magnified. In the past 10-20 years, weight reductions have made lightweight 12X and 15X binoculars a reality from a number of manufacturers, although you'll still meet some who insist that binoculars over 10X are not practical unless tripod-mounted. Today, you should count on using a tripod for binoculars greater than 15X and for some as low as 10X that are still of heavy construction or with small diameter objective lenses. There is a work around for holding them steady - we'll talk about image stabilized binoculars later on. Further, it's true that poor optics at 10X (an arbitrarily chosen magnification) will show a larger image than an 8X. However, it won't usually show more details than the image seen with 8X magnification and better optics. 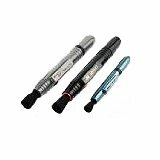 Since higher magnification power usually means a higher price, it will usually be a better value to find better quality optics at a lower magnification for the same price. Keeping all other aspects of a binocular the same, increasing power will not only decrease brightness, but will also decrease your eye relief (distance your eyes can be from the eyepieces - important for eyeglass wearers) and the field of view. Each of these will be discussed in depth later, but it's good to know that increasing power affects them. Since we brought it up, brightness isn't only affected by a binocular's power. It's is also affected by objective lens' size, coatings, prism glass quality, blackening of the barrel interior, and exit pupil (size of the circle of light visible at the binocular's eyepiece). Let's talk about blackening of the barrel interior here and leave the other things for later. If the inside surfaces of the barrel are not blackened, it generally results in extra reflected light inside the binocular - which results in a poor view. You can tell if binocular you're looking at is blackened inside the barrel by looking into it through the objective lens. Usually, looking at a slight angle is best. If you can see the inside of the barrel, it hasn't been blackened. This should not typically be a concern unless shopping for very inexpensive binoculars. You should be forming thoughts about how important magnification is to you at this point. But you should not necessarily be making firm decisions yet! Before you're finished, you will see how magnification works with other elements as you contemplate how to buy binoculars for your special interests. We sometimes get questions about what kind of binocular is needed so one can see 1,000 yards/meters, three miles/kilometers, or ten miles/kilometers, etc. The question is not a bad one, it just needs to be refined a bit. What does a person want to be able to see at those distances? You can point a binocular with very poor optics at the moon on a clear evening and see it relatively clearly - and it's thousands of miles/kilometers away! The question then becomes focused on what level of detail, color, contrast, and so on are desired at given distances. Those elements are matters of magnification, objective lens size, lens coatings, prism coatings, and more. This page will help provide the answers to those questions. Here is an excellent video by the folks at Eagle Optics. They do a good job of explaining magnification in optics. For an 8X42 binocular configuration, the second number 42 refers to the diameter of the objective lenses in millimeters (mm). The objective lenses are those at the front of the binocular - farthest from your eyes. The size of these lenses can be an significant consideration in answering the question of how to buy binoculars that will be suited to your particular needs. The principle purpose of the objective lenses is to gather light and form a sharply-defined image of a distant object. The wider the objective lens, magnification and quality being equal, the more light it gathers, resulting in a brighter view and sharper image. All other things being equal, doubling the objective size results in quadrupling an instrument's light gathering ability. For example, an 8X50 binocular has four times the light gathering capability of an 8X25 and nearly twice as much as an 8X36. The larger objective lenses in the 8X36 or 8X50 produce correspondingly wider beams of light leaving the eyepieces (the beam is called the "exit pupil"). This makes viewing with a larger objective more comfortable than viewing with a smaller objective lens in general terms and especially under low light conditions. The larger the objective lenses are, however, the more weight they add to the binocular. The additional weight may be significant for the weight conscious users intending to carry an instrument hanging around the neck for long distances. Of course, larger objectives will not be attractive to those needing a compact binocular for travel, backpacking, or fine arts performances, either. The objective size is more significant than many, if not most, realize. The physics laws of light means that details are blended in the image through what is called diffraction. This is caused by the rays of light which pass an object's edge being bent out of what would otherwise be their course by that edge. The rays going through the center of the lens are not affected this way - they're not bent. When the rays from all parts of the lens are recombined to make the image, the rays diffracted by the edge will form the halos we call chromatic aberration. As the diameter of the objective lens is decreased, an increasing number of the finest details are lost when the rays are recombined as the details that are close together can no longer remain separate. Larger objective lenses simply allow the image to pass through without the harm to the image that smaller ones inflict. If one of your main interests is in observing wildlife, you may already know that some of the prime viewing times are in the early morning and late evening twilight hours. Since wildlife is often more active at those times, you may decide an objective lens of 40mm or larger will be an advantage. If you're not physically carrying your instrument long distances or simply using it from the home or vehicle, you may decide for 50mm or greater objectives for their utility. Here's an example of applying these principles in your specific situation. We frequently carry a 10X28 binocular and a 7X18 monocular when traveling. They're both small and lightweight - easy to pack and unobtrusive to carry. We also use a 15X45 binocular for enjoyable hand-held viewing at a substantial distance. Both situations have limitations. The travel optics won't satisfy us for long-range viewing and when using the physically larger 15X45 it's more difficult to "find" what we want to view than it would be with a larger objective lens. Our primary goal in choosing the 45 mm objective lens for the 15X45 instrument, however, was to reduce the instrument's weight to a level that was acceptable to us. The smaller objective lens made a noticeable difference in the weight of the binocular for us and we were willing to both accept less light/brightness and work a bit more to visually "find" what we wanted to see. 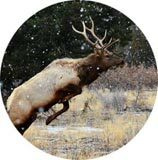 Finally, as we leave the objective lens section, you may find that you want to keep the magnification power and objective lens size in mind as you consider how to buy binoculars to provide the field of view and eye relief you want. Generally speaking, if you're watching something with action such as birds in flight, stadium sports, race track events, and the like, you'll find a wide field of view to be a significant benefit in considering how to buy binoculars. The focal length of the objectives (not their diameter) and the type of eyepieces used determine the field of view. You'll recall from our discussion of magnification power that the higher your magnification, the smaller your typical field of view. A word of caution is due here: Going with an inexpensive pair of binoculars to get a wide field of view will likely be a poor investment. This is because the manufacturer can't afford to lose money on the product (it's understandable!) and will nearly always achieve the wide angle view at the expense of image clarity and sharpness. You'll find far more enjoyment in a crisp and clear smaller field of view than a large blurry one! Even on a binocular you don't consider to be inexpensive, it's worth checking the sharpness of the image from edge to edge of the field of view. It's normal and acceptable for the edges of an instrument's field of view to not be as clear as the the images in the center, but you don't want significant blurring. Take the time to look through binoculars in various price ranges to see the differences. Some binoculars are given a "wide-angle rating." What is this? Most manufacturers consider an apparent field greater than 60° as wide-angle. The "apparent field" is calculated by multiplying the magnification by the real angle of view. For an 8X42 binocular with a 6.3° angular field, we multiply 8 by 6.3° and come to 50.4°. Our 8X42 example here would not qualify as a wide-angle binocular. Your personal "How to Buy Binoculars" criteria should be taking form! Binoculars commonly use one of two prism systems: 1) a roof prism or 2) a Porro prism (named for its inventor, Ignazio Porro). You can easily tell which system is used in a binocular since roof prism binoculars tend to have a straight tube or "barrel" and Porro prism binoculars have an offset (or "dog leg") in the barrel so the objective lens is not in line with the eyepiece. Traditional thinking was that Porro prisms provided an optical experience superior to roof prisms. Zeiss engineers found that the roof prism's phase shift could be corrected by coating them similar to the lens coatings. 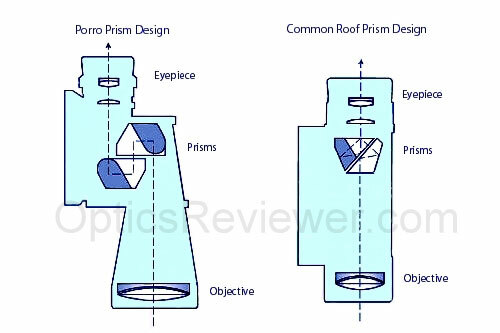 In about the late 1980s, manufacturers began applying a phase shift coating to roof prisms which produced a roof prism binocular optic equal to the Porro prism design. Phase correction coating used to be limited to the best binoculars produced by manufacturers like Zeiss, Leica, Swarovski, and Bausch & Lomb, but it was soon figured out and put into use by Nikon, Pentax, and others and became popularized in the 1990s. 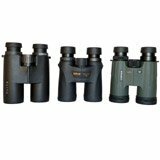 Today you can find many roof prism binoculars with phase correction coating, sometimes called "p-coating," at quite reasonable prices - you'll want to ensure that yours has it, too. Some of the p-coated binoculars made by new manufacturers are as good as or better than their European counterparts. Since the prism is a critical element of any optics, they're graded somewhat similarly to gemstones. A high-end binocular's prisms will have been selected and set apart for their quality even before they're polished and their coatings are applied. Perhaps 2-3% of prisms will be of a suitable quality for high-end instruments. The others will have tiny faults, whether scratches, small internal defects, or other flaws, that will be graded and many of which will still make good and excellent quality optics - just not the premium optics which command premium prices. Both prism designs have advantages unique to their design, however. The Porro prism design is easier to manufacture and consequently have a significantly lower price than a roof prism binocular of equal optical quality. The roof prism design is nearly always lighter and more compact than the Porro prism design. Further, the roof prism design allows a long, piano-type hinge to be used and this results in a stronger, more rugged binocular that stays in collimation better (the barrels are aligned at this point in the discussion, which keeps the axes of the optics aligned - which is a better definition of collimation! ), although this is possible with Porro prism designs that turn the offset of the objective lenses inward as is the case with some compact binoculars. As a benefit of the increased competition in quality roof prism binoculars, their prices continue to become affordable for nearly everyone. How vigorously you use your equipment should be a consideration in your "How to Buy Binoculars" criteria. Unless your equipment is going to be subject to significant bumps and bruises, however, it may not be an overriding one. When buying binoculars, there are two immediate levels of prism quality generally encountered. The prisms' glass will likely be either boro-silicate glass (BK-7) or barium crown glass (BaK-4). Although BaK-4 costs the manufacturer a bit more, you'll want it used in your binoculars because it provides a much brighter, sharper image than BK-7. There are not many other glasses used - but the density of the glass should equal or exceed that of BaK-4 glass before you accept it. You'll usually find BK-7 prisms in lower-priced binoculars where quality is sacrificed to compete on price. If the manufacturer doesn't conspicuously say that it uses BaK-4 glass in a model you're considering, you'll do well to avoid that binocular. To say it differently, people who know how to buy binoculars purchase only those which they know have prisms made of BaK-4 glass or better. Although it isn't an issue for binoculars made with Porro prisms or Abbe-Koenig roof prisms (they don't need reflective coatings because of their design), you'll want to be generally aware of the differences in reflective coatings for roof prisms. Typically, there are three reflective coatings used for roof prisms. The dielectric coating provides a reflectivity exceeding 99%, a silver alloy coating provides reflectivity in the 95-98% range, and an aluminum alloy typically provides reflectivity of 87-93%. The greater the reflectivity, the brighter the image and, consequently, the cleaner, crisper, and clearer your view will be and the greater the amount of contrast and color you'll see. Besides the Bak-4 glass you want in your prisms, you want to know about other optical glass and how it can affect your viewing experience. Standard grades of glass in lenses offer good image quality under good lighting conditions. However, if you anticipate using your instrument much under low-light conditions, there is high-grade optical glass which provides notably improved resolution and higher fidelity rendering of colors. Fluoride glass, high-density glass, and extra-low dispersion glass are three of these. Since these lenses do raise manufacturing costs, it may be time to start thinking about price as part of your "How to Buy Binoculars" criteria. The result of using these more dense glasses in the lenses is that they work to move the binocular significantly from being an achromatic optic to an apochromatic optic. The binocular does not become fully apochromatic, but these lenses do remove a significant amount of chromatic aberration in the viewed image. While it is a subtle difference to notice, what people often recognize more quickly is that image details are less muddied and it the image seems to have greater contrast. Using these lenses for a while will allow one to come to appreciate the ability to see detailed shades and hues which could not be discerned with an achromatic instrument. The difference is discernable in good light, but obvious in low-light conditions. If functionality in low light is important to you, it is something to make note of in your list of considerations. If you're approaching your first binocular purchase and you intend to watch wildlife, you may want to remember that a lot of wildlife activity occurs at twilight. That doesn't necessarily mean you need this special type of glass, just that it may be a consideration for you. Some who are shopping for binoculars have the understandable mindset that a "zoom" binocular is a smart purchase because it provides a range of magnifications for the price of one instrument. This thinking is understandable. Unfortunately, it doesn't consider compromises in optical quality required in a zoom binocular. Most would do well to avoid such an instrument. Any article on how to buy binoculars is incomplete if it doesn't pause to discuss why this is true! From the optical perspective, a zoom binocular usually requires re-focusing after changing the magnification. Because they incorporate a number of optical compromises in order to function, zoom optics are prone to significant distortions in which lines that are actually straight appear curved through the binoculars ("barreling" and "pin-cushioning"). These are more common in zoom binoculars than "standard" binoculars with one fixed magnification power. Zoom binocular eyepieces are optically compromised and result in a narrower field of view. Although it may not be the final determining factor, you'll find that regular binocular users typically take field of view measurements into consideration when choosing an instrument. The field of view for a chosen configuration can make a difference in your enjoyment. If you take it into account when making your choice, it will be an informed choice! Finally, it's not easy to find zoom binoculars that are in collimation and it's not unusual for the collimation to change as the zoom feature is used. The collimation problems alone will sharply reduce viewing enjoyment at best and provide headaches and eye strain through fuzzy or "double" images at worst - either of which will cause their owners to use them infrequently. After understanding these things, people often ask "Why spend money on something we're not likely to enjoy?" From the mechanical side, zoom binoculars are necessarily heavier and often bulkier than a standard instrument because of the zoom elements. The mechanical variations for the zoom feature are either one that is belt-driven or one that uses gears and both are complex and difficult to repair. If you feel that only a zoom binocular will satisfactorily fill your needs, you'll want to know that the gear system works more smoothly and is more durable than the belt-driven. Most binoculars have a coating on their air-to-glass surfaces to reduce reflected light and thus produce a brighter and sharper image to the user. Like the glass your prisms are made of, lens coatings are very important to the quality of the binocular and its ability to transmit light. Please pay close attention to how the coating of a binocular is described by the manufacturer because certain descriptions are standardized. "Coated optics" means only that one or more lenses have a single layer anti-reflective magnesium coating or film applied. This will usually be the first and/or last lenses - the ones you can really see. "Fully coated" should mean that all air-to-glass surfaces have been coated with magnesium flouride. "Multi-coated" means that one or more surfaces of one or more lenses have been coated with multiple films. In this situation, some surfaces could be coated only once or not at all. "Fully multi-coated" means that all air-to-glass surfaces have multiple coats or films applied. "UV coatings" are sometimes touted on a binocular. They're supposed to block harmful ultraviolet light, but they don't transmit as much light as multi-coatings, resulting in darker images. Technically, of course, two layers of film on lenses qualify as multi-coating. Top optics manufacturers typically use at least three or four coatings and often more. It's worth saving up the money or scrimping on other purchases if necessary to be able to buy a fully multi-coated binocular. (If you're considering a used instrument, multi-coatings became more widely used after the 1980s.) You'll find you actually use a higher quality binocular significantly more than a low-end instrument and your enjoyment is multiplied several times over by being able to see clear, clean, crisp images. If you've read from the beginning of this "How to Buy Binoculars" article, you're becoming an informed optics consumer and well on your way to knowing how to buy binoculars! Contrast is the ability to differentiate between both bright and dim elements of an image. Higher contrast helps you to see faint objects or subtle variations in detail. 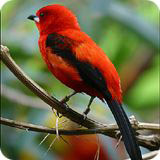 Contrast is particularly important for both serious bird watchers and for astronomy, for example. Search and rescue staff, hunters, and law enforcement personnel also find excellent contrast high on their attribute lists. Contrast is affected by the resolution - the better the resolution, the better the contrast. Better optical coatings also contribute significantly to better contrast, as does the quality of the glass in the lenses and prisms. Collimation, while not directly affecting contrast, can appear to affect it. Collimation is the alignment of the optical axes of the lenses to the mechanical components of a binocular. If they're not precisely aligned, the image seen by one eye will differ slightly from the other eye's image - presenting the brain with a blurred image. Usually, the brain will compensate for this on a short-term basis and adjust the two images into one. (It usually results in sore eyes and/or headaches as the instrument is used, though.) If bad enough, however, it will frequently appear as though one is troubled by "double vision." A binocular should be able to withstand reasonable use, but can be knocked out of collimation by jarring such as dropping it on a hard surface, rough handling, and sometimes even shipping if not carefully packaged. A high percentage of inexpensive binoculars are unfortunately already out of collimation when they're purchased. It's difficult to manufacture good quality optics without spending the money for quality components and assembly procedures! To test collimation, secure the binocular on a steady rest or tripod and focus on an image 75 to 125 yards distant, preferably with a straight line in it such as a pole, horizontal roof edge, smokestack, or something similar. Compare the images in each side of the binocular. If one is lower/higher than the other, further to the left/right than the other, or one is slightly rotated when compared to the other, the binocular is out of collimation. Unless you know how to adjust the instrument, you run a good chance of ruining your binocular in attempting it the first time or two. It's wiser to send it to a repair shop or return it to the seller/manufacturer if that's an option for you. Anyone wanting to know about how to buy binoculars will want to know about an instrument's exit pupil. That's the next topic! The exit pupil is the diameter of the beam of light leaving the eyepiece of the binocular. It's calculated by dividing the objective lens diameter by the magnification power of the binocular. In other words, a 7X35 binocular has an exit pupil of 5mm. You can easily see the exit pupil by holding the binocular at arms' length and looking through the eyepieces at a source of light. The larger the exit pupil, the brighter the image you see - one of the goals looking for binoculars. It doesn't make as much difference during daylight when the diameter of your eyes' pupils is less than the exit pupil of your binocular. However, large exit pupil is of special interest if you expect to use your binocular in low light levels or at night. As the ambient light decreases, our eyes' pupils adapt by enlarging. If your binocular's exit pupil is smaller than your eyes' pupils, it means you're not getting enough light to see clearly. On a bright day, the diameter of your pupils might be 2-4mm. Ideally, dark-adapted human pupils in excellent condition will enlarge to between 5 and 9mm. (Experiments show the average dark-adapted pupil diameter decreases with age and eventually approximates its diameter in bright light. A middle-aged person's maximum pupil average is about 5mm and an elderly maximum averages 4mm.) As you age, good quality glass and multi-coatings become more meaningful in binocular brightness than a larger exit pupil does when you're younger. At about 20 years of age, our dark-adapted eye pupil diameter will enlarge to about 7mm on average. As we age, however, the average diameter of the dark-adapted pupil decreases to about 6mm at age 40, 5mm at age 50, 4mm at around age 70, and even as small as 3mm at age 80. If you are the only person using your binocular or the users are only people in your age group and you're interested in low-light viewing, you'll do well to not worry unduly about a larger exit pupil than the approximate average dark-adapted pupil diameter for your age. That's because larger objective lenses and exit pupils add both weight and cost to binoculars. If you're over 40 or 50 years of age, large exit pupils are not likely to mean much to you as far as low-light conditions are concerned. Along with prism glass and multi-coatings, this is noteworthy for your "How to Buy Binoculars" list. With daylight conditions, you'll understand that compact 8X20 binoculars, with an exit pupil of 3.0, will be just fine. Under low light or dark conditions, however, when the dark-adapted diameter of younger pupils is closer to 6mm, the younger users will notice that they're not getting the light they'd like to have as compared to those of more advanced years. That's when an 8X56 binocular, with an exit pupil of 7mm, will give them a much better view. Astronomical binoculars, those used for astronomy, should have a generous exit pupil for younger users since they'll be used at night. Even in bright light, a 7mm or larger exit pupil will be of benefit if you're moving along in a vehicle on bumpy road or in a boat on even relatively small waves. That's because it's easier to keep your daylight-contracted pupil within the binocular's wider exit pupil. By now, you're probably seeing why one binocular configuration may not address all of your needs in an outstanding way. If you're considering your first binocular purchase, you may be best served by choosing a compromise configuration that's nearly optimal for your primary needs and a little less than optimal for secondary needs. Odds are you will never regret stretching your budget to acquire the very best binocular you can possibly afford. A fair number of years ago, this writer scrimped and saved up $250 for a good quality, first binocular which is still giving excellent service and enjoyment today. The years of pleasure that clean, clear, crisp images provide are worth it. The fuzzy images, headaches and sore eyes that go hand-in-hand with bad optics are definitely not worth the relatively small amount saved...especially when considering how very little an inferior binocular actually gets used! You're sure to see reference to relative brightness figures at some point in your shopping. In fact, we'll give them to you here for a number of binoculars just for comparison purposes. Any article on how to buy binoculars would be incomplete without at least explaining what they are - whether you use the information or not. Much like the exit pupil's calculation, the relative brightness is a mathematically calculated guide to image brightness. It's simply the exit pupil squared. An exit pupil of 5mm, would then have a relative brightness of 25. It treats all similarly configured binoculars the identically. Since you already know about the variations between binoculars due to the quality of their prism glass and coatings, you're right to not place too much reliance on this calculation. In actual optical tests, some premium-grade compact binoculars with a low calculated relative brightness are brighter than some full-size instruments. The twilight factor is another calculated guide to image brightness. Its the square root of the magnification power times the objective diameter in millimeters. As with the relative brightness, it's not particularly meaningful with today's optical glass and coatings. You aren't likely to find a binocular retailing for $50 or $75 that will have the same brightness, sharpness, and clarity of view in low-light conditions as one with good quality optics. This is life. Not even when they have an identical exit pupil. You won't even find the same brightness and clarity with 7X35 and 10X50 binoculars of equal quality - which both have a 5mm exit pupil - because the 50mm objective lens simply delivers more than twice as much light from the image, despite its higher magnification power. This is of particular interest for eyeglass wearers. Eye relief is the distance away from the eye that the binoculars can be held and still allow you to view the entire field of view image. Eyecups help in this area. For a person not wearing eyeglasses, extended eyecups help to keep the eye from actually touching the eyepiece lens. By turning or folding the eyecups down, eyeglasses can fit right up next to the lenses. If an eyeglass wearer doesn't have astigmatism, the eyeglasses can often be removed while using binoculars. Even for those who don't wear eyeglasses, a reasonable eye relief is often more comfortable since the eyes don't need to be pressed up against the eyecups in order to see the full field of view. Interpupillary distance (abbreviated as IPD) is the physical distance between the pupils of your eyes. 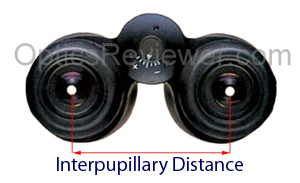 Binocular specifications usually show the minimum and maximum distances they can accommodate. This can be a factor in choosing binoculars. It is a consideration when purchasing for younger users and it's helpful that more than one brand provides binoculars especially designed for the youthful user. Near focus is the closest distance the binocular can be adjusted to a sharp focus. Binocular specifications are usually based on a young person's focusing ability - as you age, your close focus extends further away from you. Near-sighted and far-sighted individuals find that their near focus is closer and farther away, respectively. Serious bird watchers usually request a near focus of about 15 feet, but most find that 20 to 25 feet is acceptable. Some binoculars, usually at lower magnification powers, have a near focus as low/short as three feet (a meter). It's also possible to learn a lot about insects that you wouldn't ordinarly be able to get close enough to observe closely otherwise. Binocular manufacturers often find themselves balancing optical quality against the buying public's willingness to tolerate optical problems. To say it differently, it's a balance between optical quality and what consumers are willing to pay for! Perhaps the most discerning binocular users are bird watching enthusiasts, since matters of color and detail can be critical in identifying a bird. The two most common optical problems are chromatic aberrations and distortions. Anyone wanting to know how to buy binoculars will want to know about them. Chromatic aberration, the inability to bring different wavelengths of light (colors) into focus, usually produces a relatively faint halo of color around an object. It may depend on the brightness of the image and may not treat all images alike as to the color of the halo. Also, the halos may be one color on one side and another color on the opposite side. Barreling and pin-cushion effects are distortions of images in which straight lines appear in the binocular as though they were curved. When lines appear to be curved outward, it's referred to as barrel distortion. When the lines appear curved inward, it's called pin-cushion distortion. A complete absence of barreling and/or pin-cushioning can produce a "roller ball" in which it appears that you're looking at things through a wide-angle lens and the "ball" in the view seems to roll as you pan across a scene. Some have likened it to looking through a peep-hole lens in the front door. Many feel a very minor amount of barreling and/or pin-cushioning an acceptable trade off for avoiding the roller ball effect. Most binoculars focus by a center knob that adjusts both barrels simultaneously. Some, however, are designed to focus each eyepiece (or barrel, if you prefer) individually. Because focusing each eyepiece takes time and lacks convenience, center focus binoculars are much more common. Nearly all center focus binoculars have provision for a separate focus adjustment for one eye, usually the right one. This is called the "diopter adjustment." It's for adjusting for the difference between eyes, since it's unusual for two eyes to be identical in strength. Since this setting can easily be changed by accident, better binoculars provide for this adjusting mechanism to be "locked." Using this individualized focus arrangement calls for using the central focus to adjust to a sharp image for the left eye (while the right is closed) and then closing the left while focusing using the diopter adjustment for the right eye. Permanently focused binoculars (sometimes called "auto focus") are very easy to use. Although there are exceptions, both of the eyepieces are usually set and locked at the factory. If this is the case, it means that you generally won't be able to focus on objects nearer than about 40 yards (37 meters). It also means you often can't adjust the binocular for a difference in strength between your left and right eyes - a significant drawback for most because two eyes are not usually identical in strength. Eyeglass wearers will need to wear their eyeglasses with permanently focused binoculars. For those that are adjustable or for the people who can use them, however, they're very good for activities such as sporting and race track events. Individual focus for binoculars looking into infinity is usually considered quite acceptable. Astronomy would be one such use. Because of the durability of the individual focus arrangement, binoculars made to military specifications will often use individual focus. There is a particular way of focusing them that's much better than the intuitive method - see Focusing an Individual-focus Binocular. Becoming adept with individual focusing is actually quite easy. Most simply rest the binocular barrels on the heels of the hands and use the thumbs and forefingers to adjust the occulars (eyepieces). If you're using a tripod-mounted instrument it's even easier. Once familiar with it, many find that they prefer individual focus because it provides the ideal focus for each eye - every time. Of course, most of the "giant" binoculars are only available with individually focusing eyepieces. Thanks to constant improvements, most binocular configurations are now relatively lightweight. Obvious exceptions to this will be the giant astronomy binoculars in 20X80, 25X150, and similar configurations typically used on tripods. Many, if not most, compact binoculars will weigh in at a pound (half kilo) or less. Larger binoculars, up in the 10X56 range, may weigh upwards of three pounds (1.5 kilos). Zeiss and Swarovski 8X42 configurations weigh in at less than 30 ounces (850 grams) each. Most people find that binoculars weighing more than 35 ounces (about 1,000 grams) are uncomfortable to carry around the neck and 30 ounces or less is more comfortable. Use of a binocular harness, instead of a neck strap, can help with comfort. Weight distribution would be something you would want to give as much or perhaps greater consideration to. Binoculars made with poor balance may be less comfortable than heavier binoculars designed with better balance. Some use magnesium bodies to combine ruggedness with low weight. Others go to aluminum or aluminum alloy bodies. Still others use a polycarbonate. Regardless, there are many options to provide a quality binocular at a weight you can be comfortable with. Rubber armoring helps with durability in absorbing shocks from falling, bumping against objects, etc. Rubber armoring does not provide waterproofing, however! For any significant outdoor use, you'll want your binoculars to be waterproof and internally fog proof. Even if you're never outdoors when rain is predicted, there are always fast-moving storms and the inevitable occasional slip when crossing a creek that will get your instrument wet. Fog proof means that the binocular won't fog internally - it will still fog externally when you go from an air conditioned setting into a warmer, humid one! Quality binoculars are generally purged with an inert gas - the air and moisture has been replaced by nitrogen or argon gas - and then sealed with O-rings to make them waterproof. Being waterproof also means the binocular is sealed against humidity. If you live in an area where there is significant humidity, this can be important even if you never take your binoculars outdoors. This is because moisture can get into unsealed binoculars and promote the growth of a fungus grow on the optics. This is perhaps especially true of the prisms. A binocular with internal fungus growth may be able to be cleaned if attended to promptly. You're likely to note a degraded view through the binocular when a fungus is present. It's not easy to determine how well a binocular is made, although a rule of thumb is the price: usually the better the construction, the higher the price. Also, as the price goes up, the quality of the case and lens caps usually go up. Most binocular manufacturers provide generous warranties with many offering limited lifetime warranties. Of course, a lifetime warranty from a company you can't find in five years won't be worth much! The exceptions to the idea that you must put anything over 15X on a tripod are the image stabilizing binoculars available. Though there are different systems to accomplish the stabilization of the image, the effect is marvelously similar. Instead of the image bouncing about with every heartbeat or breath you take, you can see the image in perfect detail while holding a 15X or 20X binocular with only one hand. This is ideal for boaters on anything other than calm water, of course. It's also of great benefit at lower magnifications for those who may not be able to hold binoculars of any magnification as steady as they would like to be able to do. A downside may be the relatively small exit pupil for many models, depending on your intended use. Feeling better about knowing how to buy binoculars that will provide you with years of enjoyment and satisfaction? Most seasoned travelers compromise on things like objective lens size and exit pupil for a more compact and lighter weight binocular. These features allow the instrument to be taken in carryon luggage and, if small roof prisms, easily slipped into a pocket at your destination. Unless you have a particular interest or need, a magnification power between 7 and 10 will serve your needs wonderfully. Since your objective lens size will be relatively small (technically, above 30mm is no longer a compact binocular), good quality optics will help to compensate for the limited light gathering ability. We've used a compact reverse Porro prism binocular for a travel optic for years. Its compact size and light weight has made it ideal when traveling by car, plane, and train in the United States and other countries. However, we also believe in traveling as lightly as possible - frequently taking only carry-on luggage when flying. In such instances, we're likely to take a good monocular to further reduce our weight and size. Monoculars are now available in a wider variety of configurations than ever before and are of a higher quality. You can now easily find fully multi-coated and waterproof/fog-proof monoculars that are excellent travel companions. We highly recommend taking a monocular when your circumstances don't allow you to carry a binocular! A general conclusion - the best phase-corrected roof-prism binoculars your budget will stretch for are the best long-term purchase regardless of whether you're buying compacts or full-size binoculars. The same goes for monoculars. 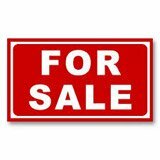 There is plenty of intermediate ground, however, with good optics, construction, and pricing!